Hajiji (second left) at the proposed site of the Banggi New Township with (from left) Bakri, Abdul Mijol and Mohamad Alamin. 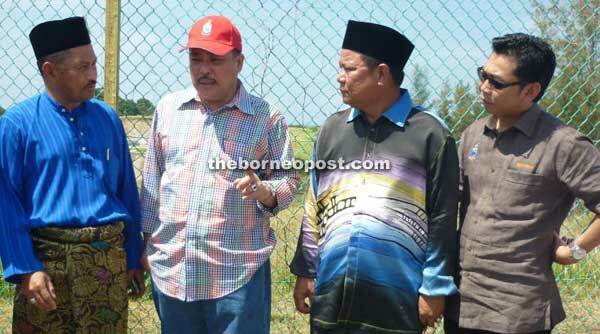 BANGGI: Local Government and Housing Minister Datuk Hajiji Noor said the State Government had approved the setting up of a new township for Banggi Island, off Kudat. He said the development of the new township would be spearheaded by the Sabah Housing and Town Development Authority (LPPB) which would be responsible for site preparation. Other relevant government agencies like the Sabah State Economic Development Corporation (SEDCO) through its subsidiary Milek Perkasa will also be involved. Soon after his arrival at the jetty after a one-hour sea journey from Kudat, he officiated at the Banggi sub-district level Quran Recital Contest and Islamic Arts Festival. Addressing the large crowd, Hajiji urged Muslims not just to remain united but also become good examples to others. “While we should be proud of our religion, we should at the same time respect others in line with the teachings of Islam. “Stay away from extreme activities or false teachings that would give others a wrong impression of Islam,” he pointed out, adding “don’t let a bad apple spoil the whole branch”. He praised the organisers of the event, saying that it was necessary as youths of today may be easily influenced by the advent of Information Technology especially social media. He also gave credit to Banggi Assemblyman Datuk Abdul Mijol for his tireless efforts to bringing development to the island since his election in 2008. “For instance, one of the projects that your YB (Abdul Mijol) has been fighting for over the years is the creation of a proper township. So today, I would like to announce that the State Government has approved the setting up of a new township for Banggi,” he said. The minister later visited the proposed site, accompanied by his ministry’s permanent secretary Datuk Matius Sator, LPPB general manager Hajah Rosnani Haji Asmat; Mijol and Kudat district officer Sapdin Ibrahim. He then attended a development briefing given by Banggi ADO, Bakri Lumundaya. Hajiji was accompanied in his visit to the island by his political secretary Kassim Razali, Town and Regional Planning director Mursidi Haji Sapie; Sabah Native Affairs Office director Haji Ahmadshah Talip; and Kudat Police chief, DSP Dawi Hussin.